If you buy sweet and sour pork from the Chinese takeaway then you should try this. The sweet and sour sauce is made from pretty standard pantry ingredients. I also included a can of water chestnuts to add a nice bit of crunch – if you can’t get those then you could use beansprouts or even diced red capsicum (bell pepper). Pork belly is very fatty so it is certainly something that you only eat every now and then. You can make this with a leaner cut of pork, such as diced loin, but the cooking time will need to be changed – I would suggest it would need only 5 minutes for browning and 10 minutes simmering, but that would depend on the size of your pork pieces. You can also reduce the water requirements of the sauce to a 1/4 cup. To make the sauce, mix the tomato ketchup, soy sauce, honey, ginger, garlic and the juice from the can of pineapple pieces in a medium bowl. Put the pork belly cubes into a large non-metallic bowl and pour over the sauce. Stir to coat all the pork. Cover with cling wrap and refrigerate for at least 30 minutes to marinate. Heat the vegetable oil and sesame oil (if you have it) in a large frying pan over a medium/high heat. Use tongs to pick up the pieces of the pork out of the sauce – set the bowl of sauce aside for use later. Add the pork to the frying pan, skin side down, and brown for 5 minutes. Once the skin side of all the pork cubes is golden, turn the heat down a little and brown on the other sides. This should take about 10 minutes and quite a lot of the fat will render out of the pieces – be careful of any fat that spits from the pan. Transfer the browned pork to a plate and then drain the excess fat from the pan. Put the pan back on a medium heat. Add the majority of the spring onion pieces, (reserving some green pieces for garnish when serving), then add the sweet and sour sauce as well as the browned pork to the pan. Also add the boiling water and stir to combine. Bring the sauce to the boil, then reduce the heat slightly and simmer for 15 minutes. Turn the pork pieces regularly during that time. Add the water chestnuts and also two-thirds of the pineapple pieces to the pan – you can save the rest of the pineapple in an airtight container in your fridge as you don’t need it for this recipe. Simmer for a further 5 minutes or until the pork is cooked through. Serve your sweet and sour pork on a bed of cooked rice, garnished with the reserved pieces of the spring onion. 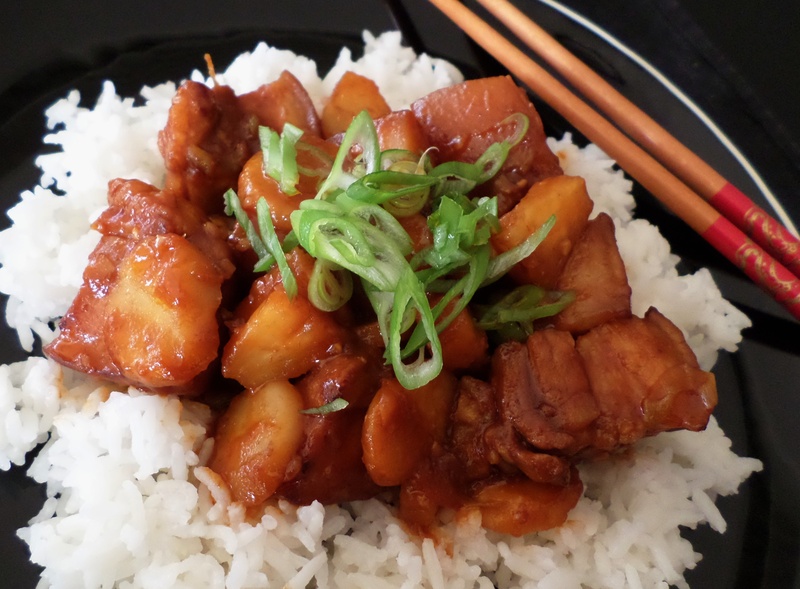 This entry was posted in Mains and tagged Asian, Chinese, Food, Pineapple, Pork, Recipe, Recipes, Rice. Bookmark the permalink. Yum! 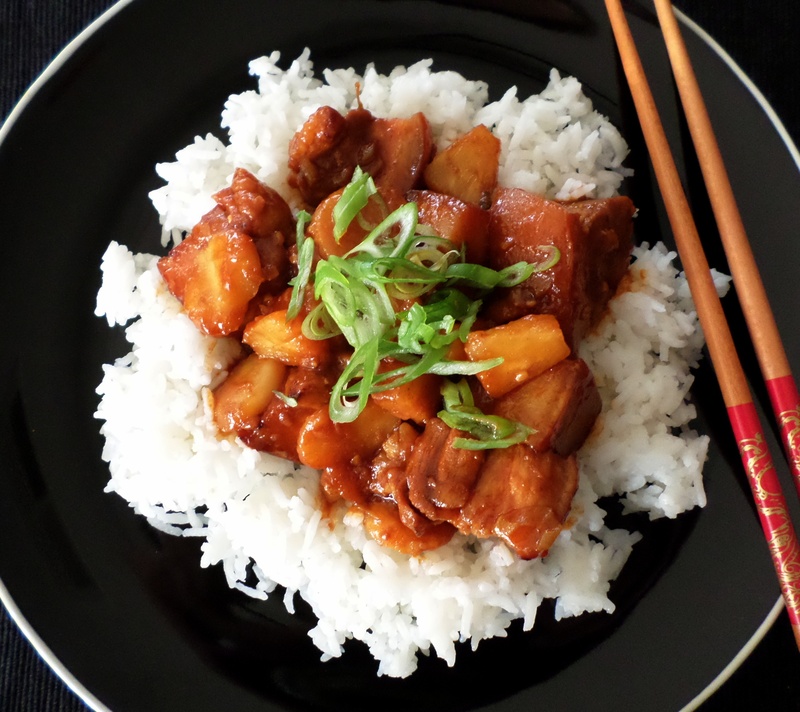 Sweet and sour pork is one of my Chinese takeout favourites too – this homemade version looks great! That looks awesome! I recently tried a recipe for sweet and sour sauce at home (to eat with crispy fried chicken pieces) and it was a little lackluster. I’m going to have to try this one soon since I’m still craving it!